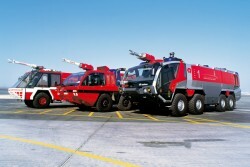 The Austrian company manufacturing fire fighting vehicles reported revenues of € 107.3m in the first quarter of 2011. Analysts expected € 108.5m. The Rosenbauer Group posted slightly lower consolidated revenues of € 107.3m in the 1st quarter of 2011 (1-3/2010: € 114.2m). Although a number of export shipments from Austria were deferred into the next quarter, deliveries to Russia were stepped up still further, leading to a significant increase in the revenues of the German Segment. This article includes a total of 643 words.